They Aquit Themselves Proudly in Welcoming the State Grand Counsellor. The six local councils of the order of United Friends gave an entertainment at Odd Fellows hall last evening in honor of the official visit of Grand Counsellor Dr. Eli H. Long, of Buffalo….Master Claude Toles did himself proud in his recitation "Adam and Eve." He was decidedly a feature of the entertainment…. The Pupils of School No. 2 Grandly Observe Arbor Day. ...A chorus forest song by the entire school and the audience was invited to witness the dedication of the trees out of doors. The school children marched out to the inspiring martial music of two piccolos, two snare drums and a bass drum. An open air chorus, "Plant the Trees," was sung, and then the first tree was dedicated…Claude Toles and Louis Uttrich, of the sixth grade, dedicated an elm tree to J.T. Trowbridge…. 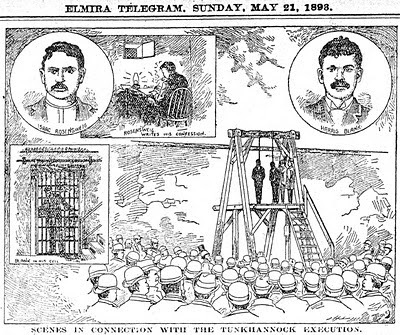 The Telegram was a Sunday newspaper and Toles was on the staff in April 1893, if not earlier. 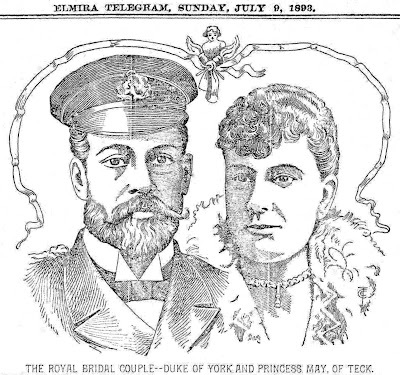 Old Fulton New York Postcards has copies of the 1893 Telegram from April 30 to December 31; the April 30 issue has seven spot illustrations featuring portraits and column headings by him. 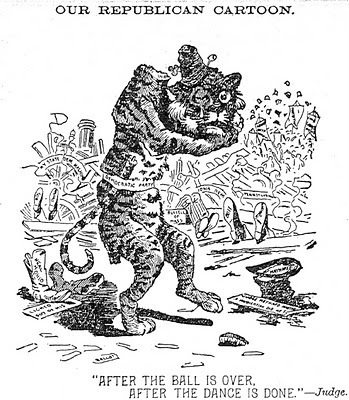 He illustrated events like train wrecks, factory explosions and executions, plus portraits of politicians, performers and buildings, and, of course, editorial cartoons. Below are samples of his artistic versatility. 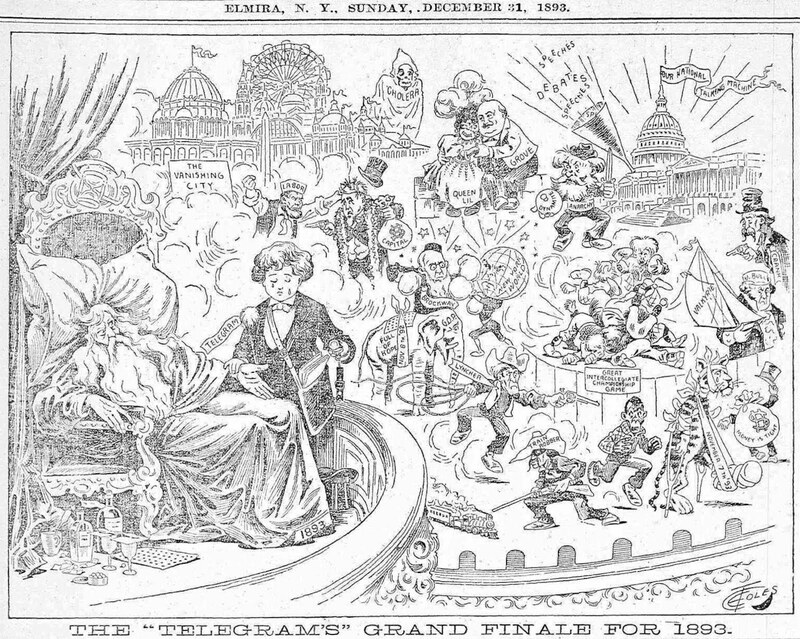 11/19/1893; original art is here. And We Appreciate the Fact. 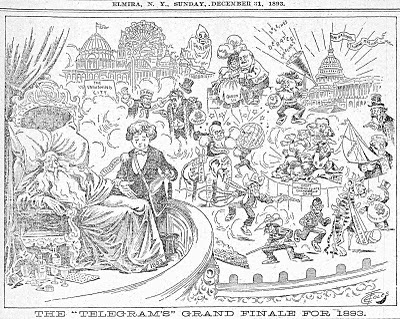 The Telegram last Sunday contained an excellent cartoon, representing President Cleveland endeavoring to solve the mysteries of the Hawaiian puzzle. The picture was a palpable hit, the idea being very pat and the delineation first class. The sketch was designed and drawn by Claude Toles, a bright young artist of the Telegram force, and proves conclusively that he possesses both talent and originality—essential elements of success in his peculiar field. 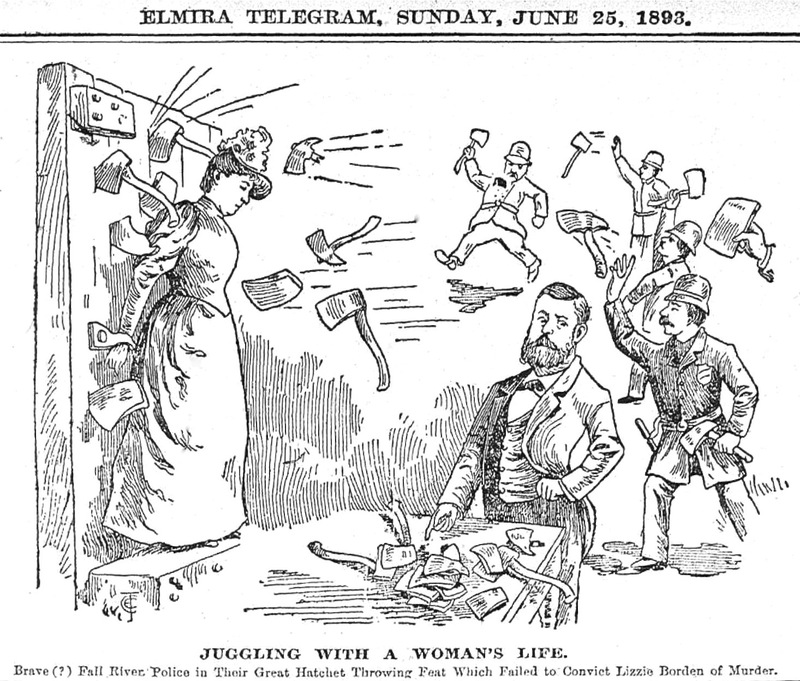 The Observer has noted with increasing pleasure the work of young Claude Toles, who of late has been doing some of the caricaturing on the Telegram. The writer learns that Manager Brooks found him one day in the rear part of a dry goods store marking boxes with a brush and black ink. He was struck with the deft manner in which the youth handled the brush, and told him to come up to the Telegram office and he would do something for him. The result was that C.E. Toles is now drawing good pay for doing one or two funny pictures a week. The Observer notes that the caricaturist has a very wide and clear conception of the political situation and does his work so that it speaks for itself, and the Observer desires to observe that if this young man perseveres and studies, sticks to Mr. Brooks and does not allow his head to get too large, he will in short time make his mark in the profession he seems to have such a cinch upon. C.E. Toles, the Telegram staff artist, has resigned his position with that paper, having been with the Telegram for nearly two years. Mr. Toles accepted a position with a southern firm and will do his work at home hereafter. Claude Toles, formerly of the engraving department of the Elmira Telegram, now of New York city, is in town. Claude E. Toles, the caricaturist and cartoonist, is recovering from a six weeks illness of grippe and typhoid fever and will soon be able to be upon the streets. C.E. 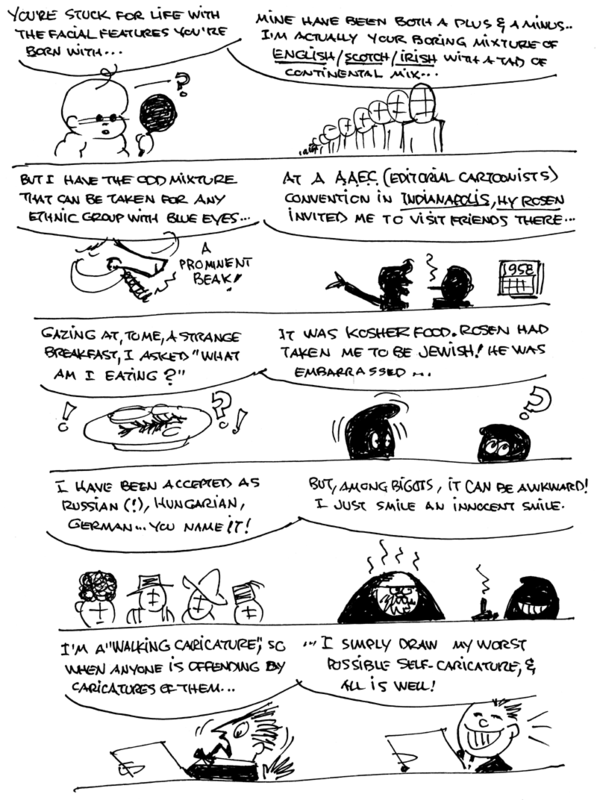 Toles, the well-known newspaper artist, has nearly recovered from a long illness of pneumonia. Miss High Kick—What's the matter, little boy? Little Boy—Kite's caught in tree. Boo hoo—can't get it. Boo hoo! Miss High Kick—Don't cry, I'll get it for you!!!$$??? Little Boy—Oh, thank you, ma'am. Claude E. Toles—"That he is still the whole 'Comic Sketch club.' "
The Big Bazaar-Carnival Opens on Thursday. ...The greatest art exhibit of its kind ever seen in this part if the state will be at this fair. The exhibition contains the collections of cartoons and caricatures of Eugene Zimmerman, of Horseheads, known the world over under the name of "Zim." This collection embraces eighty-four of Zim's original pen drawings and his collection of pictures by other artists loaned by him to the bazaar-carnival. 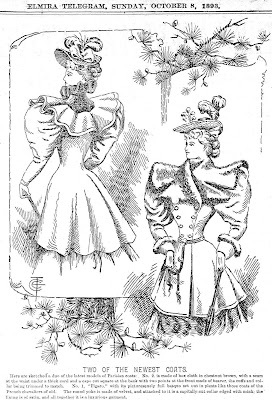 Claude E. Toles, the well-known Elmira artist, has loaned forty of his pen drawings, including the best examples of his work in portraiture of up-to-date bicycle girls, piquant soubrettes, airy summer girls, shapely ballet girls, also his broadly humorous drawings, as well as his collections of pictures by other artists. 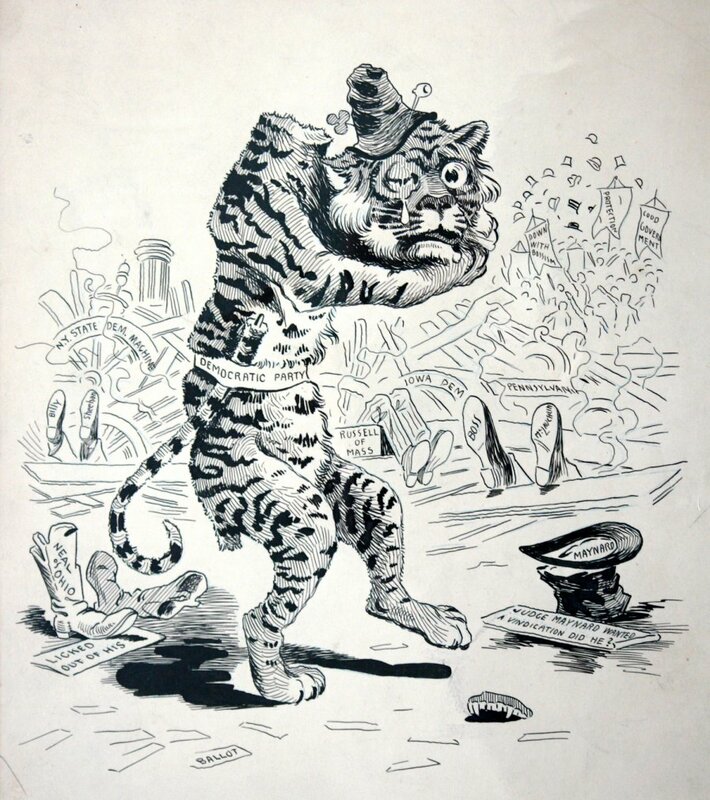 The gallery will contain drawings by Phil May, the famous caricatures of London Punch, Bernhard Gillam, Joseph Keppler, E.W. Kemble, F. Opper, Fithian, A.D. Rahn, Hy Mayer, and twenty-seven others, the best known magazine artists in the country. The gallery will be put in shape under the direct supervision of Mr. Toles…. Claude Toles—"To make war sketches." Claude Toles, the artist, has gone to Baltimore, where he was called by a telegram from the president of the Baltimore Sketch Club, asking him to come to that city and be in readiness to sign a year's contract. Bohemia Was All Excitement Last Night. The Occupants of a Boat Were Thrown into the River—Thought They Were Drowning in Three Feet of Water—Brave Men to Rescue. …Yesterday afternoon there were four occupants in the two boats, the party going out for a spin on the river. The Grit was manned by Editor John R. Joslyn, who was a visitor at Meneyata [sic] cottage, and Claude E. Toles, while the new boat had as its occupants Attorney Charles Marvin and Roy B. Delo. The two boats pulled away by sturdy oarsmen pointed out to the middle of the stream and then began a battle for supremacy. The Dasher…capsized and two forms were seen struggling in the water…. …Editor Joslyn forgot all the rules he had ever learned about rescuing drowning people in his eagerness to get an item and hastily taking out his note book began to take down the frightened utterances of the now almost exhausted young men. Claude Toles was also glued to the boat without power to render assistance. His artistic abilities did not leave him for an instant however and he was soon sketching the scene for the next issue of the Police Gazette…. …The incident illustrates the need of a life saving station and it is probable that Mayor Bundy will call the attention of the common council of Bohemia to the fact at the next meeting, also to adopt suitable resolution and prepare a leather medal for Messrs. Joslyn and Toles who by leaving the young men alone allowed them to reach the shore in safety. For several years Claude E. Toles of this city, a well known artist, has been connected with the Baltimore Comic sketch club, which furnishes illustrations and articles to newspapers and magazines—syndicates them. Recently C.B. Lewis, known to the reading public as "M Quad," joined forces with the sketch club and Mr. Toles has been assigned to illustrate his article in the future. These two will make a pretty strong team and ought to greatly enhance the popularity of the sketch club. A Wedding of Two Popular Elmirans That Occurred Wednesday Last. The marriage of Miss Maude O. Drake, daughter of Dr. and Mrs. E.G. Drake, to Claude Eldridge Toles occurred Wednesday, September 20th, the Rev. W.T. Henry officiating. Mr. Toles is an artist of ability, whose work is in demand by the best publications, and his bride is a young woman of accomplishments. The good wishes of a host of friends go out to the happy couple. A Large Number of People Were Present Last Evening and Viewed the Collection—Interesting Paper by Mrs. Jabin Secor. …The display of sketches by Claude Toles occupies one entire side of the room. The variety shown in his sketches called forth much comment from the visitors, all of whom praised his drawings highly. A number of sketches of pretty girls drawn by him were myth admired, while the caricatures included in the series of "Caricature Portraits of Men in the Public Eye," comprised all the well known personages famous in many lines. 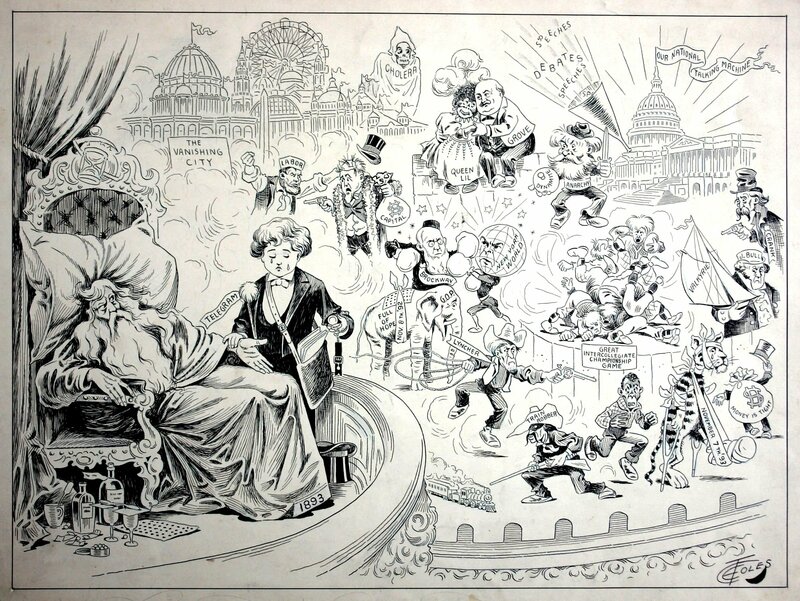 A number of sketches on political themes were also noticed in Mr. Toles' exhibit. 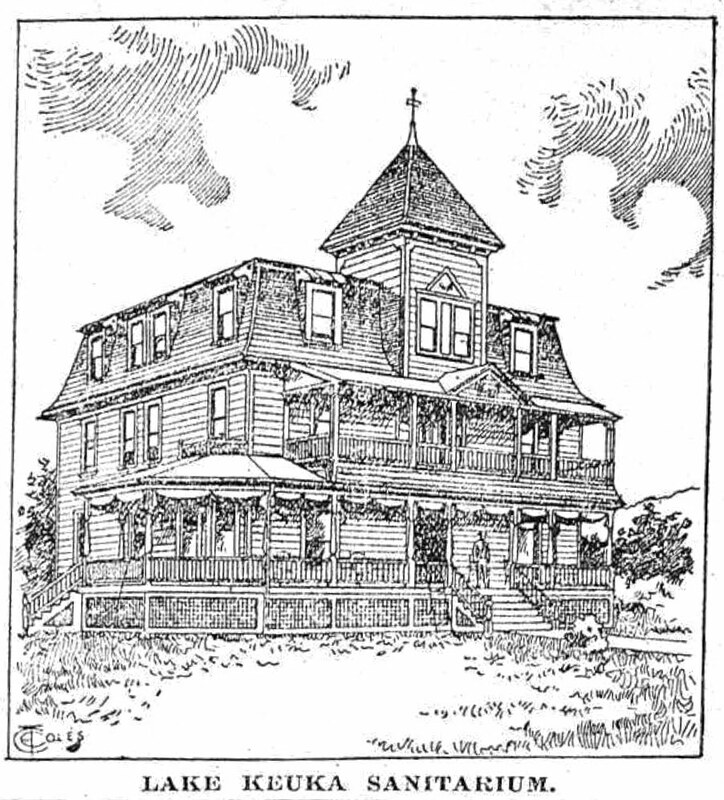 A drawing of the Meneyata cottage, the home of the Pine Cliff club of Bohemia on the Chemung, attracted the attention of many familiar with the scene of the sketch. Elmira talent was well represented by the work of Mr. Toles and a drawing by Edward A. Wader, while the display of Zim's drawings reflected much credit upon the village of Horseheads. …"A very attractive and interesting collection of pen drawings is the work of Claude E. Toles, which well shows his talent and versatility. Mr. Toles is a member of the International syndicate, which has its headquarters in Baltimore. This distributing bureau sends electrotypes of sketches to the newspapers subscribing to their service throughout the United Sates and to some portions of Europe. Ex-Vice Consul Wildman wrote that he found several of Mr. Toles' sketches in a Hong Kong paper and at several English ports. The artist is not a specialist, although he has a distinct and very attractive type, but draws pretty girls, also grotesques, high society—gutter snipe society, political cartoons, animal life, under the signature of 'Dix;' war scenes, in both the army and navy, portraits, legitimate and caricature, and general newspaper illustrations. Well worth study are his series of present day caricatures of people now in the public eye. Many of these have not been published. Elmira may well be proud of this young artist, who has his home among us. He was born here and received his education in our schools. He belongs to the army of young illustrators who have come to the front of late by virtue of great talent and industry." "I ought not to stop speaking without adding that the success of this exhibit is due largely to the co-operation of Mr. Toles, who from the first has given a great deal of his time to the details of the work, and without him the exhibition could never have been." Claude E. Toles, Elmira's talented artist, and his wife, will move to Baltimore, Md., Monday, where they will reside in the future. Claude and Maud lived at 1620 Madison Avenue in Baltimore. Their daughter was Virginia Neilson Toles, born 1900 in Baltimore. Art by Toles dominates the page which includes Jean Mohr, "Midget", and another. Mr. Bobbin—"Young man, do you smoke cigarettes?" Little Boys—"Oh! no, sir. Tobacco contains nicotine, one drop of which will kill a dog. Cigarettes cause organic disturbances of the brain, stomach, heart, lungs and liver, ending in St. Vitus' dance, epilepsy, dyspepsia, apoplexy, bronchitis, consumption, insanity and death." Mr. Bobbin—"Oh! well, if you feel that way about it I'll just throw away this box of cigarettes I was going to give you." The Rev. O. Shaw Fiddle, D.D. A selection of strips is here. 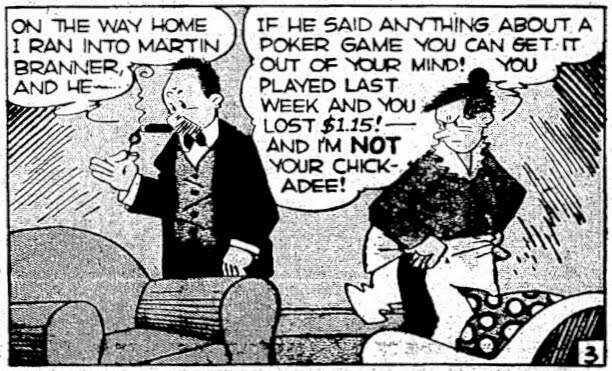 Word comes from Baltimore that Claude E. Toles, formerly of this city, is the winner of a billiard tournament recently finished in that place. Twelve crack Baltimore players contested for four prizes and Mr. Toles won first place and a beautiful billiard cue. Death of the Well Known Artist Who Formerly Resided in This City. Claude E. Toles, a former well known resident of this city died last evening at 6 o'clock, at the home of his father-in-law, Dr. E.G. Drake, at Cornwall-on-the-Hudson. A telegram to that effect was received in the city last evening by the deceased's mother, Mrs. Estelle M. Toles, widow of the late Wallace Toles, who resides at 503 Baldwin street. The particulars of the unexpected demise of the young man have not been learned. For a couple of years past he has resided in Baltimore. Claude E. Toles was twenty-five years old. He was born in Elmira and was educated in public schools here, later being engaged as clerk in Harris' dry goods store. For several years past he has been widely known for his exceptional talent in drawing and cartoon work. He began his artist's career with the Elmira Telegram. In a short time he was able to conduct his work independently, until he received an offer from the New York Herald which he accepted at the same time contributing considerable work to other illustrated periodicals. Mr. Toles' ability was widely recognized and he became connected with an art syndicate publishing company in Baltimore, which position he occupied at the time of his death. He secured the high place in his work not alone through ability, though that was exceptional, but his indefatigable energy and perseverance were always noticeable and worthy of emulation. The deceased was a few years ago married to Miss Maude Drake, daughter of Dr. E.G. Drake, a former West Church street physician. He is survived by an infant daughter besides his wife and mother. The remains will be brought to Elmira for interment. The body of the late Claude E. Toles arrived in the city over the Erie this morning at 3 o'clock and was taken to the home of his mother, 503 Baldwin street, where the funeral will be held at 2:30 o'clock Thursday afternoon. The interment in Woodlawn will be private. Rev. Dr. Henry will officiate. Saturday's Column of Fact, Fancy and Gossip. When Claude E. Toles the artist, whose untimely death this week came as a severe shock to his friends, first entered business life it was as a cash boy in a dry goods establishment in this city. In that capacity he failed to reach the degree of excellence attained by the model cash boy who rises step by step until he becomes a member of the firm and hires boys himself. Young Toles, on the contrary, spent most of his time at the counter where the wrapping paper was stored and there were few customers who did not carry home evidence of the genius that was in a few years to make him one of the best known newspaper illustrators in the land. The proprietors of the dry goods emporium decided at various times to discharge Toles, but they would run across some humorous sketch he had drawn and laugh and give him a new lease of life, which showed, perhaps, that they were human but not good business men. About the time that Toles business career hung in balance his work came to the notice of "Zim," the famous cartoonist of Judge, who, with other friends, started the young man in the right direction. He did work for various publications until the goal was apparently reached when he had a page in colors in an Easter number of the New York Herald. 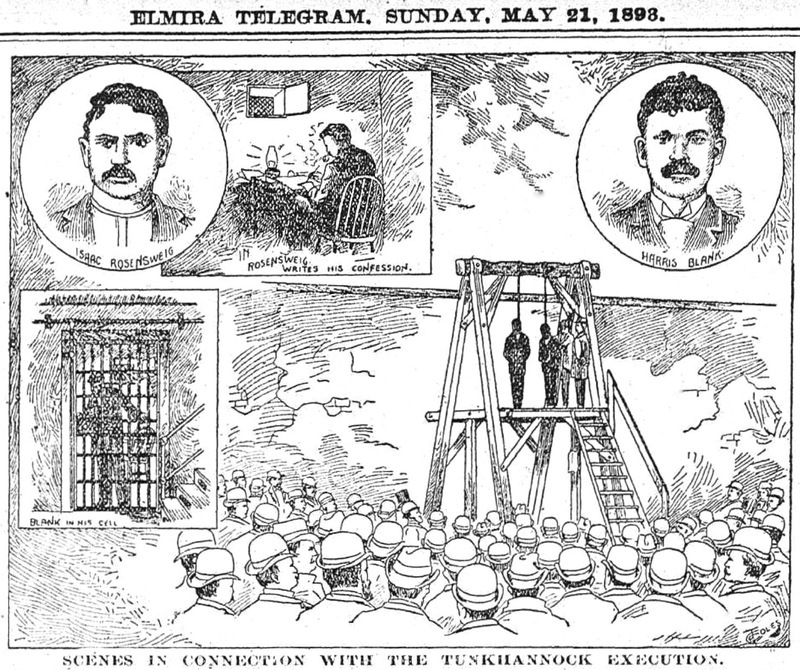 Shortly thereafter came a cablegram signed by James Gordon Bennett asking the young artist to go to New York and live and become a member of the Herald's staff of artists. The offer was declined and Toles associated himself with a Baltimore syndicate, later retiring to form a similar organization of his own, at the head of which he remained to the time of his death. His work made the service of the syndicate eagerly sought after. It was marked by bold originality and many preferred it to that of Gibson or Wenzell. When the casket was lowered into the ground at Woodlawn this week, after a few comforting words had been said by a good minister, the loss was almost as great to lovers of good, clean drawing as to the bereaved family of the young man. Daniel Francis "Bud" Counihan was born in Connecticut, January 10, 1887, according to his World War I draft card at Ancestry.com. In the 1900 U.S. Federal Census, he was the second of nine children born to Daniel and Anastasia. They lived in Norwich, Connecticut at 51 Oakridge Street. His father was an iron moulder. Counihan was recorded as a newspaper cartoonist in the 1910 census. He was part of his father's household in Norwich at 55 Oakridge Street. In 1913 his strip Hinky Dee was published in the Trenton Evening Times from May 12 to October 13 (Allan pipes up: it is unclear who syndicated this strip, but it was syndicated; I have a run in the Pittsburgh Post for instance; at one time my guess was the Chicago Record-Herald or the Philadelphia Record, but I never found it in those papers). 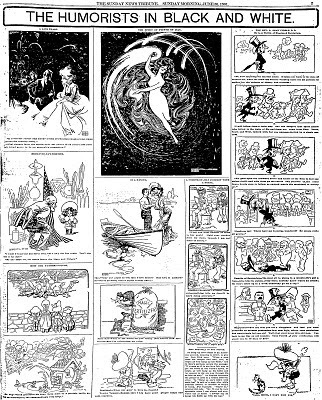 The Bridgeport Post (Connecticut) published, on January 6, 1972, the Associated Press obituary which said, "…Counihan began his career in Norwich, Conn., as a sports cartoonist and came to Providence round the turn of the century. He later worked at the Washington, D.C., Star and joined the staff of the New York World in 1915 [sic; 1914--Allan]. 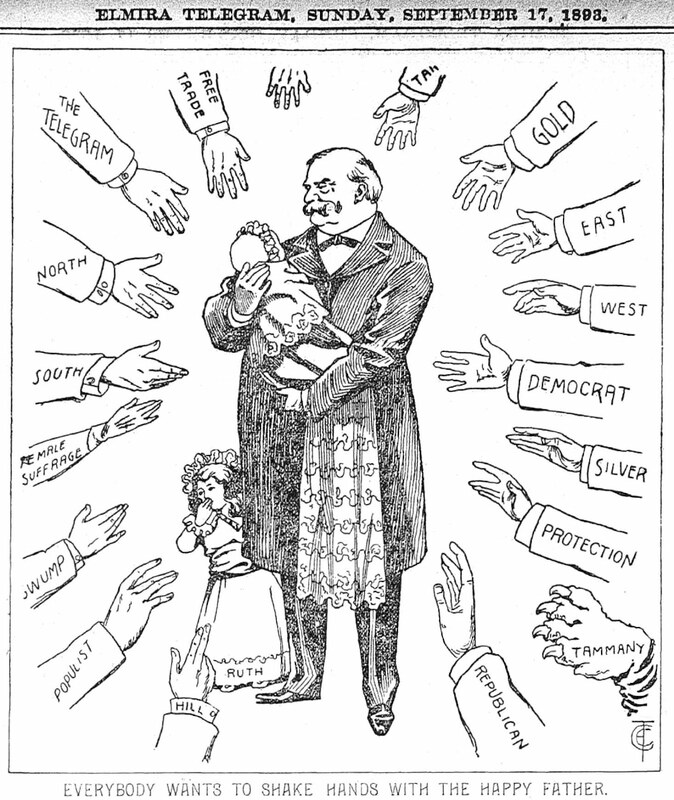 He remained with the New York World until that paper ceased publication about 1935 [sic; he left in 1928--Allan]. Over 400 of his New York Evening World comic strips and sports cartoons (1915–1922) can be viewed at Chronicling America. He signed his World War I draft card on June 5, 1917. He lived in Brooklyn, at 580 22nd Street, with his wife and two children. His occupation was newspaper cartoonist for the New York World. His description was tall, slender, with blue eyes and brown hair. Counihan has not been found in the 1920 census. A 1922 photo of him with other cartoonists is here. His strip Little Napoleon began in 1923. It was followed by Pinhead Dooley in 1928. At Ancestry.com his name was transcribed as "Durell F Counchan" in the 1930 census. He lived in Brooklyn at 1860 East 19th Street. His wife, Margaret, and two daughters, Anita and Francine, were all born in Washington, D.C. The success of the early 1930s Betty Boop animated cartoons, was followed, in 1934, by the King Features comic strip by Counihan and Hal Seeger, according to Wikipedia. During this time, Counihan's oldest daughter, Anita, a model and actress, may have been better known than her father. Counihan passed away January 5, 1972, in Wakefield, Rhode Island, according to the Social Security Death Index. Martin Michael Branner was born in New York, New York on December 28, 1888, according to his World War I and II draft cards at Ancestry.com. In the 1900 U.S. Federal Census, the Branner household lived in Manhattan, New York City at 242 East 110 Street. Bernard and Minnie, Romanian emigrants, had seven children. Branner's twin brother was Isidor and they were the second oldest of the siblings. In the 1910 census, Branner lived with his in-laws, the Fabbrinis, in Manhattan at 120 West 103 Street. His occupation was actor in theater; his wife, Edith, was an actress. They had been married three years. He signed his World War I draft card on June 5, 1917. His occupation was vaudeville actor. His description was short height, slender build, with blue eyes and brown hair. The couple were with the same household at the same address in the 1920 census. After short runs on Louie the Lawyer and a few other strips, his hit comic strip Winnie Winkle the Breadwinner debuted September 20, 1920, according to the Syracuse University's Special Collections Research Center's collection of Martin Branner cartoons. Ten years later, the Branners lived in Queens, New York, at 608 157 Street, with their two sons, a nurse and servant. A New York Passenger List recorded their return from Bermuda on March 30, 1939. They lived in Flushing, New York at 4749 157 Street. Branner was profiled in the August 5, 1939, Editor & Publisher. In the early 1940s, a police officer named "Martin Branner" appeared in Ad Carter's Just Kids. Branner signed his World War II draft card in 1942. He lived in Waterford, Connecticut. His employer was the Chicago Tribune-New York News. His description was five feet four inches, 145 pounds, blue eyes and gray hair. The World-Herald (Omaha, Nebraska) published a profile of Jack Berrill, Branner's assistant, on October 24, 1958. ...Mr. Berrill, 35, has been a comic-strip artist since his teens…. [He] is Brooklyn-born and was graduated from Brooklyn Tech in 1941. He refused an art scholarship because his father thought added study would ruin his style as a cartoonist. As a result, Mr. Berrill went to work as a copyboy on the New York News. His salary: 18 dollars a week. But opportunity knocked in the form of Martin Branner, the creator of Winnie Winkle, another World-Herald comic feature. The New York Times published news of his wife's passing on January 3, 1966. Branner passed away May 19, 1970, at the Nutmeg Pavilion Convalescent Hospital in New London, Connecticut. The Times published his obituary two days later. I moved our weekly Herriman post to today, since I was not about to let such a lovely example of kismet go to waste. 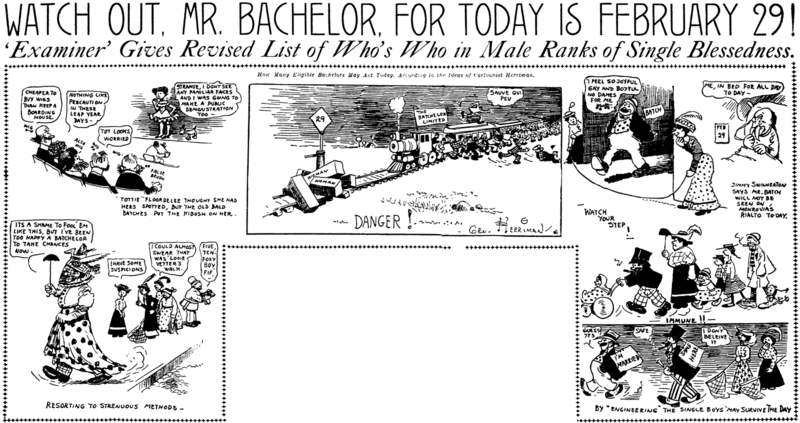 Oddly enough, our regular Saturday post this week was to be the cartoon above, which discusses marriage and was published on February 29th, 1908. Well, 104 years later to the day, February 29, 2012, I have some marriage news of my own. I am happy and proud to announce that today your blog host has been accepted into the bonds of matrimony with the most beautiful, intelligent, witty, charming girl in the world. Assuming, that is, she doesn't have a last moment attack of clarity and runs for the hills. Assuming all turns out as hoped, Mr. Stripper and his blushing bride plan to spend the next month occupied exclusively in billing and cooing, and not paying one iota of attention to comic strips. Therefore, for the month of March the Stripper's Guide blog is under the exclusive direction of Mr. Alex Jay, who has my deepest appreciation for taking on the task. I trust you will treat Alex Jay as a special guest and not as a subtitute teacher. Play nice while I'm gone kids, and I'll see you in April! Congratulations, Mrs. Holtz and Allan Holtz! Have a splendid Honeymoon March, we'll see you soon. I hope she enjoys old comic strips! Wait, comics researchers can marry a "beautiful, intelligent, witty, charming girl"? Hurrah, there is still hope for us! Congratulations, and enjoy your honeymoon! George L. Lee was born in Jamestown, New York on July 27, 1906. In the 1910 U.S. Federal Census, Lee was the youngest of two sons born to George and Grace. They lived in Jamestown at 839 North Main Street. His father owned and operated a barber shop. In 1914, Grace took her two sons to Spokane, Washington, and later to Wenatchee and Seattle, where Lee graduated, in 1925, from Garfield High School. As a senior he was interested in art but had little formal training after high school, just a few months at the Chicago Art Institute. Lee has not been found in the 1920 census. He moved to Chicago, in 1927, where he worked, for five years, as a messenger at the Pure Oil Company. The company magazine recognized his talent and he drew some of the covers. His interest in sports illustrations led him to the boxing publication, Bang, which published his first drawings on its cover in 1929. In a short time, Lee met Chicago Evening American sports editor, Eddie Geiger, who liked his work. The front page of the August 24, 1930 sports section was his debut in a major publication. He also contributed sports drawings to the Chicago Tribune. Lee has not been found in the 1930 census. A syndication deal fell through, in March 1933, when it was learned that he was black. He rebounded quickly when Chicago Defender editor, Lucius Harper, collaborated with him on a series called Sporting Around. 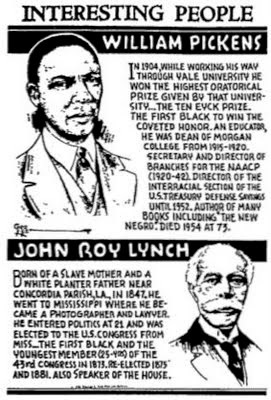 The following year, the Pittsburgh Courier engaged Lee to work on the feature, Your History, with text by J.A. Rogers, a black historian. In 1936 Lee married Jennie Hicks; they had a son. He continued to freelance while employed, beginning in 1937, at the Postal Service. His series, Interesting People, combined portraits and brief biographies of black Americans. The series ran from 1946 to 1948. In the 1950s the International Boxing Club used Lee's talents for their publicity cartoons for the big fights in Chicago. In 1969 he retired from the Postal Service. The following year, he returned to Interesting People, which ran until 1986, the year he retired; he was 80. The Chicago Metro News (Illinois) published the panel from September 25, 1976 to June 2, 1990 (probably included reprints after his 1986 retirement); he was profiled (see photo) in the October 2, 1976 issue. His work was collected in four books from various publishers: Interesting People (1976, 1989, 1992, 1999), Interesting Athletes (1990, 1993), Inspiring African Americans (1991) and Worldwide Interesting People (1992). I believe Lee passed away on November 3, 1999 in Columbia, Maryland. The Social Security Death Index has a "George L. Lee" with the same birthdate and his Social Security number was issued in Illinois. African American Biographies: Profiles of 558 Current Men and Women (1992). Chicago Metro News (Illinois), October 2, 1976, "Author of Interesting People Highlighted", p. 5. Bill Chase seems to have been a part-time cartoonist and full-time editor at the New York Amsterdam News from the mid-30s to 1942. He contributed a comic strip, Pee Wee, which wasn't all that well-drawn or deftly written, but had the presumed asset of being done by someone on staff, and therefore incurring no extra out of pocket expense for the paper. According to Tim Jackson's Pioneering Cartoonists of Color site, Pee Wee continued through the war. I have to take exception. 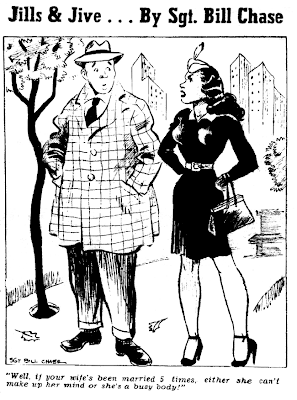 Chase seems to have disappeared from the paper entirely after August 1942 and doesn't return until late 1945, now with the title of Sergeant on his cartoons. Obviously he went off to war. I see no cartooning output from him in the paper during the interim. When Chase returned to the fold he may well have resurrected Pee Wee. I don't know because I have not had access to the Amsterdam News any later than the end of 1945. I can say, however, that when he returned his first foray back into cartooning was the panel cartoon Jills and Jive, a feature with weak gags and art, which mattered very little since the main point was to offer a drawing of a scantily clad buxom honey -- a function which it fulfilled handily. Jills and Jive first appears in the December 8 1945 edition of the Amsterdam News, and I can't offer an end date since I have not indexed the paper from 1946 on. Ah, I remember when Beatty thought you were German. Love the reaction shot in the lower left panel at the bottom of the page. Isn't it about time for another marathon breakfast?